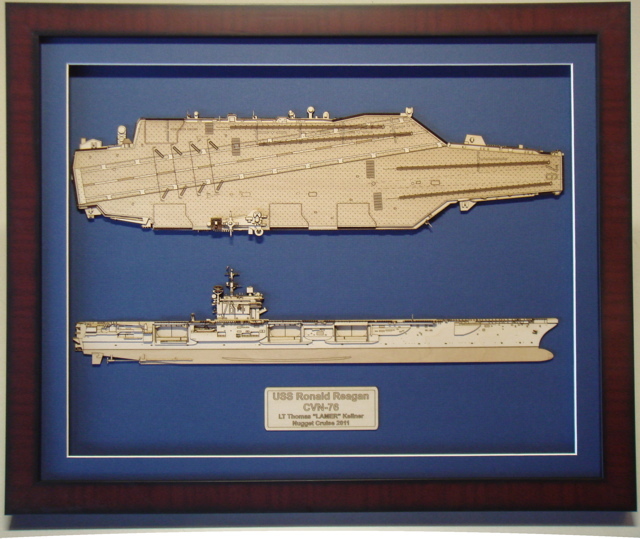 The photograph is the wood half hull model of the USS Reagan. 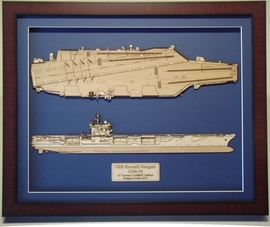 We can produce a half hull model of any of the eleven Nimitz class carriers. Please send us an e-mail request for the ship configuration you would like. We can also add a personalized nameplate listing the name, rank, and years served aboard the ship. Please include the exact wording desired on the personalized nameplate in the comments section of your on line order. You can also send the personalized text in an e-mail. The outside frame dimensions are 22 x 36. Every Nimitz class carrier varies in its exact configuration and we make a special effort to depict the ship as she was actually configured during the personalized dates you request. We do all individualization on a first come, first served basis which may require some additional lead time for production. If you need a wood model by a certain date, please contact us at least 60 days in advance of your required delivery time. Please e-mail us for a detailed quote and or answers to any additional questions you might have.